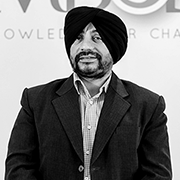 Kultar Singh co-founded Sambodhi in 2005, guided by a belief that data-driven insights would be a valuable tool to help organizations and institutions change the way they make decisions. His foresight and vision for evidence-based decision-making has been central to Sambodhi’s transformation into a leader in impact measurement. 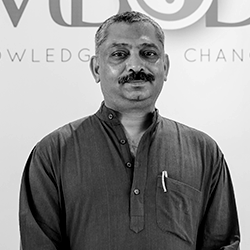 As a monitoring and evaluation expert with nearly two decades of experience, he brings to Sambodhi a background of global thought leadership. This has successfully guided several pioneering research designs developed by the organization. He has been a sough after advisor and lead consultant for several high-profile projects spanning a range of thematics, including health and nutrition and public systems. Kultar has a post graduate degree in management studies from Indian Institute Forest Management. When he's not talking data and research, Kultar can be found playing cricket or watching it on television. We are proud of the fact that we have been able to build a learning institution. It has been our endeavor to build a more humane organization— an institution which is vibrant and open; an institution that provides us space to be ourselves and drives us to be better professionals and better human beings. 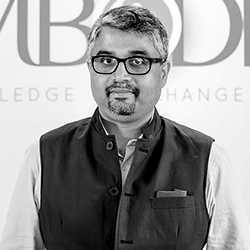 Swapnil Shekhar, a co-founder of Sambodhi, is the Chief Operating Officer of its board of directors. To him, Sambodhi is the result of a set of innovative minds matching their commitment to improving lives to a vision of building an institution of global standards. As the director of evaluation, he leads Sambodhi’s efforts to make quality, actionable data available for evidence-informed decision-making. 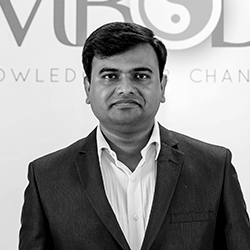 Swapnil's leadership has been key in the transformation of Sambodhi into a fast-growing global enterprise. He sets and evolves the strategic direction for the company and its portfolio of offerings, while nurturing a strong leadership team to drive its execution. Swapnil is also a Rockefeller Foundation Global Fellow (2015) and contributes to the Foundation’s global development sector discourse. He holds a degree in management studies from Indian Institute of Forest Management. Swapnil is known among friends and his Sambodhi colleagues for his excellent taste in coffee and cakes! We wanted to build a global company that helps governments and institutions solve critical problems through data intelligence. It gives me a great sense of accomplishment to mentor those who share our vision and watch them learn and grow every day. 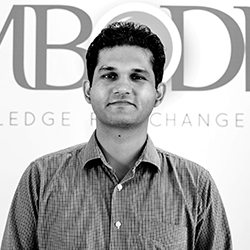 Dharmendra Chandurkar, a co-founder of Sambodhi, is also its Chief Knowledge Officer. It’s a position that reflects his long-standing interest in academia, especially in supporting social science research and promoting social and economic well-being. In his 15-year career, Dharmendra has straddled roles across academia and the development sector as a leader, professional trainer and researcher. He has several publications and research papers to his credit that continue to be cited global academia. Dharmendra is not just an avid reader, but Sambodhi’s resident poet and most popular food critic. We are driven by pursuit of excellence. It is this never-compromise attitude that defines Sambodhi. 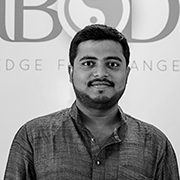 A co-founder of Sambodhi and its Chief Finance Officer, Nitin Sharma believes in driving institutional change through innovation and thought leadership. Nitin oversees Sambodhi’s negotiations with governments and multi-lateral entities across the development sector globally. He mentors a team of business, legal and corporate affairs professionals who manage the company’s legal work, its intellectual property portfolio, policy and corporate governance. 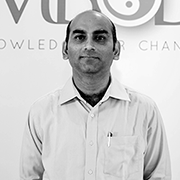 Apart from being the CFO, Nitin also advises the training and capacity building division at Sambodhi. He has been part of the leadership team that has consolidated Sambodhi's position as a leading name in professional capacity building services. Nitin has a masters degree in management studies from the Indian Institute of Forest Management. When he is not crunching numbers, he’s either playing or tracking his favourite sport - badminton. I draw inspiration from my own team. I believe in them and their capability to do great things. As Vice President of Business Development, Sudhanshu drives strategic planning, global operations and shapes development initiatives across diverse markets. He is one of Sambodhi’s global faces and thrives on matching approaches to projects and exploring new business models and revenue streams. 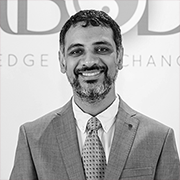 Sudhanshu is passionate about building global partnerships and ensuring that Sambodhi’s clients and partners receives services of international standards. He also oversees the setting up of new systems and processes for effective client relationship management, project effectiveness, delivery excellence, quality assurance and leadership development. Sudhanshu has a masters from the London School of Economics and Political Science in Analysis Design and Management of Information Systems. He also holds a degree in information technology from Delhi University. Apart from work travel, Sudhanshu also devotes time to travelling for fun and adventure, and often comes back with stories that are worth curating. As Vice President- Public Health Practice, Vikas steers and coordinates the technical aspects of Sambodhi's work in the area of public health. He also oversees project implementation. As a senior member of Sambodhi’s leadership team, he also represents the company on numerous technical project committees. Vikas is passionate about working at the forefront of advancing global health equity and strengthening health systems delivery. Over the course of last ten years as public health professional, he has been involved in training programs, and carrying out research and evaluation projects — both qualitative and quantitative — around adolescent health, mental health, sexual and reproductive health and rights, and youth-friendly health services. Vikas is a staunch advocate of developing and scaling up innovative, evidence-based health practices, programs and policies, and has written and spoken at several forums. Apart from being a qualified doctor of medicine, he also has a PhD. in Public Health from the Lund University, Sweden. Vikas loves cricket and table tennis - especially when its played in the true spirit of sportsmanship and is not competitive. 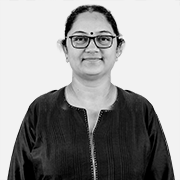 Mouli Dholakia is Advisor, Human Resource Development at Sambodhi. In this role, she is responsible for envisioning the HR roadmap and its driving strategy. Always solution-oriented and objective, she is Sambodhi's go-to-person for managing critical situations. Mouli holds a postgraduate diploma in HR from Symbiosis Centre for Management & HRD. Mouli is an avid reader and loves photography. A travel enthusiast, she is quite popular among her colleagues and social media followers for her adventurous narratives. She is passionate about teaching and when not traveling, she is usually exploring new ideas in HR and organization development. Kishor Purohit is an Assistant Vice President – Business Development at Sambodhi. He came into the organization as a research and measurement professional with over twelve years of experience in social development sector. However, it wasn’t long before his colleagues and clients began seeking his well-honed experience and natural instincts for complex business development and client interaction matters. In his current role, Kishor advises the organization on major partnerships, exploring and pursuing new opportunities, analyzing potential exposure, and more. With every new partnership he gained insight that solidified his reputation as a go-to within the business development team. Today Kishor works like a champion of engagements, talking with clients, understanding their needs, and then pulling in various subject matter specialists from around the vast Sambodhi network of consultants and experts. Arnab Dey is an Assistant Vice President – Research at Sambodhi and has over 6 years of experience in measurement studies. His work at Sambodhi involves evaluating processes, tools and projects as well as thinking creatively about the problems that could arise, potential mitigation techniques that can be considered and how to deliver the insights. An expert in STATA, SAS, R, SPSS and Tableau, he is lead trainer for Sambodhi’s data analytics training imperatives on statistical analysis software packages including STATA and R.
Arnab sees his job as a responsibility to challenge and improve the way things are being done. One of Arnab's favorite attributes of Sambodhi is the high value placed on speaking up—to help clients achieve their goals. 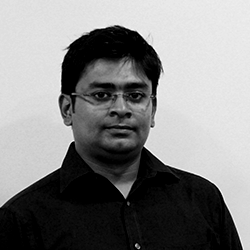 Ramanshu Ganguly is an Assistant Vice President-Research at Sambodhi. He believes that tools and technology, when applied in the context of relationships surrounding them, can tackle and improve the knottiest of problems. At Sambodhi, Ramanshu's work revolves around conceptualizing various socio-economic welfare measurement tools and he has successfully ensured their application on the ground. He has more than 5 years of experience in driving evaluation studies in the domains of renewable energy, natural resource management, livelihoods, agriculture and climate change. 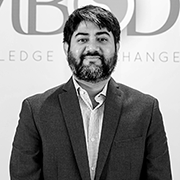 He is proficient in handling and applying different statistical analysis software such as SPSS, STATA and R.
As an Assistant Vice President-Research, he also has responsibilities in deepening client relationships, pursuing new business, and helping develop Sambodhi's key offerings. All of this work blends his love of science and precision with his interest in people and their motivations; all of which is hugely rewarding to him. Varun Dutt is an Assistant Vice President – Research at Sambodhi. This position gives Varun a frontline role in how evidence is helping improve the decisions and processes that support organizations as well as individual lives. Over the last 5 years, he has worked in diverse sectors including energy and environment, health & nutrition, livelihood, agriculture, education and WASH. Varun has more than 3 publications to his credit in impact evaluation studies. Varun works with a team of measurement professionals and oversees several measurement studies and conducts and manages large scale surveys. His role also involves designing research tools, sampling design and sampling strategy, as well as refining and implementing these, while providing guidance to his team every step of the way.